Welcome to Rising Star Promotions Website. Click on the links on the right side of the page to see more of the site and some of the entertainers we can book for you. If you have seen an entertainer on TV or have heard them on the radio we can provide them for any of your events. Corporate Events, Birthday Party’s, Festivals, Concerts, Etc. Any of these Artist can be booked for you “By Special Arrangement” through Rising Star Promotions. If you are interested in someone that is not on our page please ask and we will see if they are available. We are a talent agency that will book your entertainment needs from A to Z.. This is just a few of the entertainers that we can book for you. See more by clicking on the National Artist page to the right. 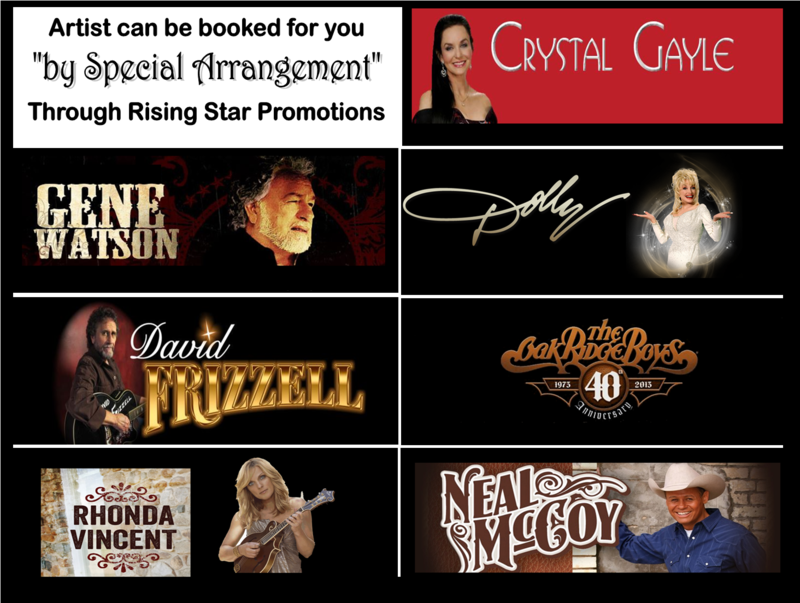 Any Tribute to Country Legends Shows done at other venues or events are Not Associated with Rising Star Promotions. These shows are not ours unless stated on promotional material or advertisements, and must have the logo above on all advertisements, Flyer's etc. If you are in question about any of our shows please contact Rising Star Promotions by filling out the Contact us form on the right of this page. We will contact you back when get it. Please don't forget to give us your phone number in the comment box.